While some parents may simply forget to add their newly licensed teen driver to their insurance policy, others intentionally do not notify their carrier about the new driver in the house in an effort to save money from the unavoidable increase that comes when their teenager gets their Nevada driver’s license. In Nevada, insurance companies require you to provide a list of all drivers in the home, regardless of whether or not they are going to be driving the insured vehicle. Should your teen driver not be disclosed and then becomes involved in an accident in the insured vehicle, your insurance company can legally deny any claims associated with that accident. Needless to say, this could be a devastating financial blow to a family as they would be responsible for their own repairs to the insured vehicle and very likely personally responsible for for damage and injuries caused to others. In the State of Nevada, studies show a 132% increase in insurance premiums between an adult driver alone compared to an adult driver adding a teen driver to their insurance policy. Specifically, in Nevada, the average adult pays $1,113 per year on insurance. By adding a Nevada teen driver, that rate jumps up to $2,651 per year. These figures were based on a 2014 Honda Accord driven by a 40-year old driver with 100/300/50 liability coverage with comprehensive and collision. As you can see, the increase is quite substantial! With regards to gender equality, many think that the insurance carriers are out of line. The fact is, “gender equality” in most states does not apply to insurance companies while other states have outlawed the practice of charging different rates to males than female (Pennsylvania, Hawaii, Massachusetts, North Carolina, Montana). In general, there is not much dispute as to the fact that teen drivers are for more likely to be involved in a traffic accident than adults. What insurance companies have also found is that teenage boys present significantly more risk in becoming involved in a traffic accident than their female teenage counterparts. So, in Nevada, be prepared to pay more if you have a teenage son than you will if you have a teenage daughter. Now that the gender issue has been addressed, lets look at some other ways that you can save money if you have a Nevada teen with a driver’s license. These are just a few of the discounts offered by many insurance carriers in Nevada. These are in addition to the usual discounts such as multi-car discounts, family plan discounts, low mileage discounts, etc. Always be sure to ask about these discounts as insurance carriers and agents might not be readily aware of your situation and the applicable situation that applies to you. Taking driving lessons in Las Vegas for those who reside in and around Clark County is one of the best ways for teen drivers to get a discount on their automobile insurance. In most cases, parents of teen drivers often pay for their minor children’s automobile insurance by adding them to their own policy. Unfortunately, as most parents of teen drivers know, the cost significantly rises when a teenager is added to the policy. The reasons for this increase are obvious; you are allowing someone with very little driving experience to drive your vehicle on the streets of Las Vegas. As statistics show, teen drivers aged 16-19 are three times more likely to be involved in an accident than those aged 20 and above. Needless to say, this is why insurance rates go up significantly when a teen driver is added to an insurance policy. Many insurance companies offer discounts for Clark County area teen drivers that take driving lessons in Las Vegas from a DMV licensed driving school. When an insurance discount is offered, the insurance companies usually require the teen driver to take at least 6-hours of driving lessons with a professional driving instructor, through a licensed Las Vegas driving school. One student recently reported to us that their carrier offered a 25% discount in exchange for her completing 6 hours of behind the wheel instruction with our school. Of course every insurance company is different and the rates and discounts will vary. The point is, you should call your carrier to see if they offer a discount for teen driving lessons (behind the wheel) and find out just how much that discount is. In most cases, the cost of driving lessons in Las Vegas may pay for itself pretty quickly by way of behind the wheel driving lessons. In this post, we will teach you how to practice parallel parking. Most people seeking a Nevada driver’s license are fully aware that parallel parking is one component of the Nevada driving skills test. In fact, this single maneuver is what most people dread most about the driving test. Those that get “hung up” on the driving skills portion of the test also forget that 90-degree parking (aka perpendicular parking) and backing out of a parking space are also scored during the Nevada DMV driving test. In this post, we will take a look at parallel parking on the driving skills portion of the test and provide some pointers for practicing. Years ago, the Nevada DMV would actually have you parallel park behind a parked vehicle spotted along the driving test route. The rumor is that there were too many accidents occurring to those innocent bystander vehicles along the Las Vegas roadways, that the DMV decided to set up their own parallel parking course on site at the various Nevada DMV offices. Today, each full service Nevada DMV has a closed parallel parking course set up in or near their parking area. They can be recognized by a front set of 2-3 barrels and back set of 2-3 barrels with about 40-feet or so of space in between the sets of barrels. During your driving test, the DMV examiner will have you parallel park between the front and rear set of barrels. A passing score will have you successfully parking parallel to the curb between the barrels with no more than 18 inches from the curb. Striking a barrel is an automatic failure, as that is considered an at fault accident during your driving test. Perfecting your parallel parking skills takes practice. The fact is, here in Nevada, we usually don’t suffer from a lack of places to park. As such, we really don’t get much practice parallel parking like those living in San Francisco, New York or Boston. At our Las Vegas driving school, we can usually teach new drivers how to master parallel parking in a matter of a few tries. For those of you who want to practice parallel parking on their own, we strongly recommend going to the DMV where you plan to take your driving test an practice on that DMV parallel parking course. The DMV allows for you to practice there just as long as you do so when the DMV is closed. This means you can practice all day on Sunday or during the week after 5:00 pm after all driving tests are complete. As some people might not have much opportunity to practice at the DMV, they can easily set up a course in their own neighborhood. To do this, all you need are a couple of trash cans, large boxes or cones. I prefer trash cans because they are roughly the same size as the DMV barrels. To set up your own course, simply find a straight curb or sidewalk and place one barrel against the curb and have the other trash can placed 10 feet away from the curb (the far edge of the trash can should be at the 10 foot mark). These two cans will represent the rear bumper of the “car” you are going to parallel park behind. You really don’t need trash cans to the rear but if you want to, set those approximately 30-40 feet behind the front cans. Those who do not take professional driving lessons sometimes aren’t aware of everything that goes into parallel parking during a Nevada DMV driving test. There really is a lot to it. For example, you are expected to use your turn signal when parallel parking – even though you are on a closed course in a back parking lot. You should also use your turn signal as you exit the spot. Secondly, while you will be expected to look over your right shoulder when backing up, you are also expected to look over your right shoulder before backing, as the front end of your vehicle will swing out to the left as you are attempting to parallel park (assuming you are doing it right!). At this point, there are a few different methods for actually maneuvering your vehicle into a parallel spot. The method we teach in our Las Vegas driving school is known as the S-Method. The following are step-by-step directions for using this method. turn your right turn signal on and pull up so that your right rear (passenger side) wheel is even with the front barrels, approximately 2 to 3 feet away. In a real life situation, the barrels would be the rear bumper of the car you intend to park behind. With your foot firmly on the brake, shift the car into reverse and turn the wheel all the way to the right. Slightly let off the break, holding the wheel all the way to the right as you back up slowly. When your vehicle is at a 45-degree angle to the left barrel (or rear bumper), stop your car completely. While stopped completely, turn the wheel all the way to the left and hold it and slowly back up until your vehicle is parallel to the curb (you should be directly behind the barrels nice and straight). If you did everything correctly, your right side wheels should be less that 18 inches from the curb, giving you a passing score on the parallel parking portion of the Nevada driving test. We hope this post sheds some light on the dreaded parallel parking portion of the driving skills test and helped with suggestions on how to practice parallel parking. Check back soon to learn the secrets of perpendicular parking and reversing out of parking spaces. I Just Passed My Nevada Driving Test! Passing your behind the wheel test and getting your driver’s license is a rite of passage all over Nevada. At that moment, you are now authorized to drive a car…..alone. An adult no longer has to ride with you. You are now free to drive whenever and with whomever you wish. Or are you? Nevada has laws governing a new teen driver’s driving privileges. It isn’t a free-for-all once you pass the behind the wheel test. The reason these laws were passed is simple. Newer teen aged rivers are less experienced, more prone to accidents and far more prone to distractions than those drivers who have been driving for awhile. For these reasons, Nevada has instituted a “graduated driver’s license”, or GDL. The idea is to gradually give the new driver more freedom and more responsibility, rather than setting them up for failure because they lacked the experience to handle either. Now that we understand the logic behind the program, let’s be clear about what you can and cannot do as a newer teen driver. Step one. It all starts with a learner’s permit. Once a Nevada teen turns 15½, they are eligible to take the learner’s permit written exam. Provided they pass this exam and their parents or guardians approve, the permit is issued. Step two. Once you have the permit, you must drive with a licensed driver for 50 hours. This driver must be 21 years of age or older and must have been licensed for at least a year. 10 hours of the 50 hours must be driven at night. A log of these hours must be kept and signed by the parent or guardian attesting to the fact that you actually drove these hours. If you pencil whip (cheat) the log book, instructors at the DMV can tell when you take your test because your inexperience shows. You will have a very difficult time passing and, if found out, the DMV will not issue your license. It is unlawful to forge the logbook. Step three. Once you turn 16 and have completed the required 50 hours, you are eligible to take your behind the wheel test. Once passed, you now have full driving privileges, but with a catch. For the first six months, you cannot drive with anyone under the age of 18 in your vehicle unless they are an immediate family member. The reason for this is simple. Newer drivers are so excited to get out there with their friends that they tend to be distracted and much less safe than they would be otherwise. This restriction seeks to minimize that danger.
. Until you turn 18, you may not drive between the hours of 10 p.m. and 5 a.m. There are exceptions to this, such as traveling to and from a sponsored event, like a school sporting event or family gathering, but it is generally not allowed. Driving around late at night right after you get your driver’s license is a sure way to get stopped by the police. Many cities have curfew restrictions, too and these apply whether or not you are in a vehicle, so be careful out there. Step four. Once you turn 18 and you have maintained a driver’s license, you can consider yourself a driver with no restrictions. You can now officially drive when, where and with who you want to, as long as it is lawful. Remember that violation of these laws can set you back in your quest for a license. If you are cited for an infraction of these laws, your driving privileges can be suspended. If you get caught doing it enough, the judge may deny your driving privileges until your 18. No one wants that. These laws are designed to allow you freedom, but just enough to teach responsibility, too. The state of Nevada cares about it’s driver’s and passed these laws to help foster good habits with new drivers. Keep your future in mind when you’re a new driver. You’ll be doing it a long time, hopefully. https://www.nvdriversed.com/wp-content/uploads/2016/09/las-vegas-drivers-ed.jpg 334 500 NVDriversED https://www.nvdriversed.com/wp-content/uploads/2017/02/nv-drivers-ed-logo-new.png NVDriversED2017-03-20 17:10:052017-03-28 16:36:54I Just Passed My Nevada Driving Test! 1. Parent or Guardian: this is an obvious one, but all teen drivers under the age of 18 years old must bring a parent or guardian with them at the time they are taking the driving skills test in Nevada. The parent or guardian must be present to sign the Financial Responsibility Statement and the Affidavit for Minor to be Licensed. These are Nevada DMV forms that are required before a teen driver can take the skills test. 2. Instruction Permit: A Nevada Instruction Permit is also required at the time of the test. The teen driver should already have had this for at least six months, at which time they should have at least 50-hours of driving experience with their parent. 4. Driver’s Education Certificate: when you complete a Nevada DMV 30-hour driver’s ed course, you will be given a certificate of completion. This drivers ed certificate will be given to the Nevada DMV as proof that you completed the course. 5. Completed Beginning Driver Experience Log (DLD130): This is your driving experience log that must show you have completed 50-hours of driving experience with at least 10 of those hours completed during the hours of darkness. 6. Application for Driving Privileges: This form can be found here: http://dmvnv.com/pdfforms/dmv002en.pdf – there is a place for the parent to authorize a teen driver to drive. 7. Vehicle with Valid Registration and Current Insurance: This is obvious. You will need a registered and insured vehicle to take your test. Keep in mind that you can use any vehicle in the class of the Nevada drivers license you are seeking but you cannot use a rental car. Make sure that the vehicle you use is safe in that the brake lights, headlights, horn, turn signals are all operational. Also, the tires should be in good condition and there should be no cracks or other things on the windshield that could impair your vision. The Nevada DMV examiner will conduct a brief safety inspection of the vehicle before you proceed with the driving skills test. Be sure to bring all the above items (and people) to the Nevada DMV at the time of your test. Completing these forms prior to your testing date and time will ensure a less stressful experience when you arrive. Nothing is worse than scheduling a driving test only to find that you forgot to bring something with you! This will mean rescheduling your test and a longer wait to get your Nevada drivers license. Utilizing a Las Vegas driving school when first learning to drive is one of the best things a new driver can do. Taking driving lessons with a professional driving instructor allows new drivers to put their best foot forward from the very start. In doing so, a new driver quickly develops good habits, exceptional knowledge and confidence from the very beginning. Oftentimes, we are hired to provide driving lessons just before a student takes their driving test, only to find out that the new driver has picked up several bad driving habits that would surely sink their chances of obtaining their Nevada driver’s license on the very first try. While parents certainly do not intend to teach their children unsafe or improper driving habits, some of these bad habits just sort of “creep” in due to the parent having years and years of driving experience, not realizing that some of what they do are not completely proper, legal or safe. Some of these “bad habits” are not even known to the parent until their child employs the same bad habit during a drive test, resulting in a drive test failure. Our Las Vegas driving school allows students to get off to an excellent start. In most cases, just a single lesson with a professional driving instructor will alleviate the anxiety a parent has when first teaching their child to drive. After a couple hours with a professional instructor, the new driver will possess the necessary skills to safely maintain their travel lane, slow and stop the vehicle when needed, accelerate smoothly, make safe lane changes and safe turn movements, just to name a few. Much of the parent’s anxiety comes from having no control over the vehicle when their child is behind the wheel. It’s truly a powerless feeling when you are unable to stop the vehicle because you are seated in the passenger seat. Hiring a professional driving instructor to provide the very first driving lessons to your child can make all the following parent / child driving lessons much more enjoyable and panic free. Remember, your child needs a minimum of 50-hours of supervised experience. Most of this will be spent with you – the parent, seated in the passenger seat without the ability to control the vehicle. Make that time more enjoyable and stress-free (for you and your child) by hiring a Nevada DMV licensed, professional driving instructor. Doing so will go a long, long way in your child’s driving education. Driving schools in Las Vegas fill up quickly during summer and winter breaks. Be sure to schedule early! To schedule driving lessons in Las Vegas and the surrounding areas, call us at 702-907-9992. Many students ask, “If I buy a red car, will the police stop me more often and give me a ticket?” Some people believe that the police focus on red cars because they stand out in a crowd or they are more prone to have drivers who speed or break the law. This is probably due to insurance companies rates for sports cars. Red is a common color for sports cars and sports cars go fast. People that buy sports cars like to go fast and when they do, they crash more often than they would otherwise. Sports cars are also very expensive to repair, so insurance rates are much higher for these types of vehicles. Red has much more to do with rates of insurance for the type of vehicle than with tickets from the police. There is, however, a direct correlation to the color of the vehicle you drive and your chances of getting stopped. Studies show that you are more likely to get stopped if you drive a white car. The reason for this is simple: white is the most common color for cars. Silver or gray is the second most common color and, you guessed it, is the second-most ticketed vehicle color. Let me assure you that the police do not focus on red cars. Our company was founded by two police officers, both with a combined four decades of police experience. Red cars are no more eye catching than a jacked up four wheel drive, a motorcycle with loud pipes or a minivan. It is a car and what attracts the attention of the police is what the driver is doing with the car. Studies have shown the color of the car makes no difference in the driver getting a ticket if it is stopped. In fact, when asked, police will tell you that it is the seriousness of the violation and the attitude of the driver that most influences their decision to issue a citation. As we all know, always be polite because you never you know if it could be the difference between a ticket and a warning. If you like red cars, rest easy. The police are not out looking to stop you, but just remember that it is what you are doing in that red car that counts. The NV Drivers Ed Team encourages all of our students, their parents and all future drivers to remain dedicated to keeping our streets safe. It is a life long endeavor and begins at home, cultivated in young drivers and shows results all through life. Be safe, everyone! As you may know, NV Drivers ED not only has the #1 online teen drivers ed course in the State of Nevada but we also offer driving lessons in Las Vegas and the surrounding areas. Our Las Vegas driving school is the only school in Nevada that is owned and operated by local, recently-retired police officers. These professional and friendly instructors have had great success not only in teaching the skills necessary for you to easily pass the Nevada driving test but also making safe, courteous and defensive drivers on our Nevada roadways. As a Nevada DMV licensed driving school, we currently serve the entire Clark County area including Las Vegas, Henderson and North Las Vegas. Our instructors have taught teens from virtually every school in the Las Vegas Valley, including Bishop Gorman, Green Valley High School, Faith Lutheran, Coronado, Clark, Desert Oasis and Silverado High School…just to name a few. At NV Drivers ED, the safety of our students is always our top priority. All of our Las Vegas Driving school vehicles are model year 2016 or newer. Each vehicle undergoes a complete safety inspection and they are all equipped with dual control brakes that allows the instructor to slow and/or stop the vehicle should it be warranted. This allows our students the ability to learn and to progress faster with their driving lessons. Knowing that the instructor beside them can intervene with the vehicle controls if needed helps makes students feel more comfortable and relaxed when beginning to learn how to drive. Once of the best things about our driving school in Las Vegas is that new drivers hit the road quickly and therefore they can more quickly gain the knowledge and skills they need. Many parents have expressed how much easier it is to teach their children to drive after they have had lessons with one of our professional driving instructors. Once the student spends time with us, they have a firm grasp on maintaining travel lanes and they have become accomplished with making proper lane changes and turns and they have experience in being able to slow and stop the vehicle when necessary. This alone makes for much less anxiety when parents are sitting in the passenger seat while their child is at the wheel. To sum it up, as a parent, your time riding with your child will be much more pleasant after they have had lessons with our driving school. Our driving school offers free pick-up and drop-off at your home. There is no need to come to us….we come to you! This is a convenient way for our students to maximize their time behind the wheel and it saves parents having to wait around for their children to finish their driving lesson. Lessons are typically 2-hours long but they can be customized to fit your needs. We offer lessons throughout the week and on weekends. We teach everyone from the complete beginner who has never been behind the wheel to those who are just struggling to pass their Nevada DMV driving test…to everyone in between. To schedule your next lesson, please call us at 702-907-9992. The following points are the top 5 steps, in recommended order for obtaining your full Nevada drivers license. If you are a teen, under the age of 18 years old, Nevada law requires you to take a 30-hour Nevada driver’s ed course before you can get your Nevada driver’s license. This drivers ed course can be taken in a classroom or online, as long as the course is licensed by the Nevada DMV. Although this step is not required to get a Nevada instruction permit, it makes more sense to do so before taking the written permit test for two reasons. (1) Taking this course first, since it is required anyway, will vastly help you achieve a passing score on your Nevada permit test on your very first try. Remember that a large percentage of first time permit test takers do not pass the written test on their first try. Taking this course before your test significantly increases your chances of passing the written test on your first try. (2) Students can take a Nevada driver’s ed course when they are 15 years old, but they cannot take the Nevada instruction permit written test until they are 15 1/2. This gives the student 6 months to prepare for the written test while also completing a course that is required of them to take. The two portions of testing required by the Nevada DMV in obtaining a full, Nevada drivers license are the written test, also known as the “knowledge test” and the driving test, also known as the “skills test.” Both must be passed with an 80% or better to pass. The Nevada DMV does not take appointments for the knowledge test. You simply need to show up, provide proof of age (birth certificate) and have a parent with you to sign the necessary paperwork. There is also a fee required each time you take the test. While an appointment for the knowledge test is not needed, you will need an appointment for the behind the wheel skills test. Remember, a skills test cannot be taken until you have had your Nevada Instruction Permit for at least 6-months. In many states, taking driving lessons with a licensed driving instructor is a requirement. This, however, is not the case in Nevada at of yet. 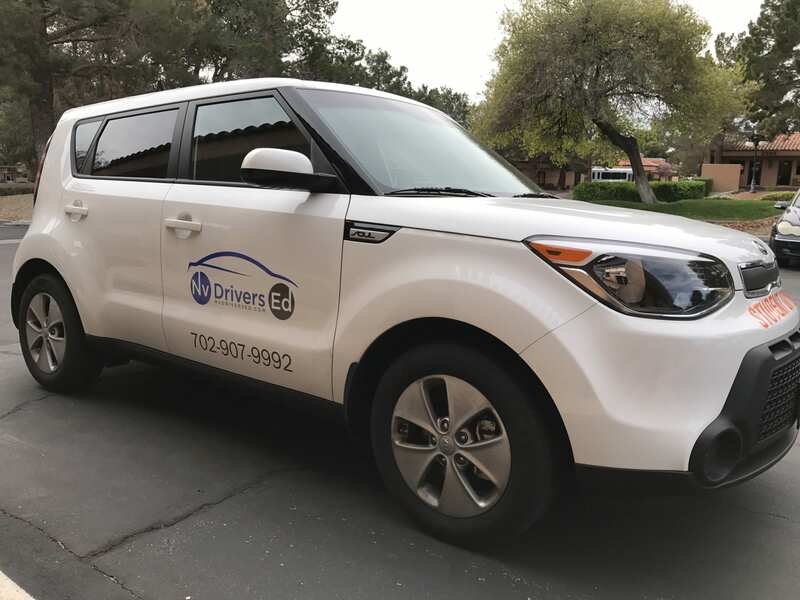 Although it is not required in Nevada, we strongly encourage new drivers to take a few behind the wheel driving lessons with a licensed Nevada driving school. In our experience, these lessons with a licensed instructor not only will help you to more easily pass your skills test, it will also make parent practice sessions much less stressful. When a student learns the basics of driving with a professional instructor, the skills learned during those sessions go a long way in their confidence and abilities when they take the road with their parents. As you may know, a teen driver must log 50 hours of behind the wheel experience before they can apply for a full Nevada drivers license. 10 of these experience hours must be conducted at night. This means during hours of darkness – not just time of day. In other words, if you are taking your night time driving hours at 6-8pm in July, the DMV will not count this as night time because in southern Nevada, the sun doesn’t set until late during the summer months. Many students make this mistake and are turned away by the DMV for not having enough night time driving experience. A good thing to follow in getting your 50 hours of driving experience is to keep a notebook in the vehicles you will be driving. Then, every time you get behind the wheel, ensure that you log your time. Those quick 10-minute trips to the grocery store or drives home from school can really add up. Also, don’t forget to log your behind the wheel hours that you spend with your professional driving instructor! The final necessary to obtain a Nevada drivers license is the skills test. This is where the rubber meets the road and you get to demonstrate everything you’ve learned along the way between your 30 hour teen drivers ed course and your 50 hours of driving experience. Yes, you will be nervous. Everyone who takes the test feels the same way (even adults!). The key is to relax and focus on your driving — not what the evaluator is writing, thinking or doing. The evaluator will guide you along a testing route, but they will not help you. They are they only to ensure that you possess the skills to drive safely on Nevada roadways. Take each direction by the evaluator as a test. When they tell you to change lanes, remember that they are evaluating your lane change. When they tell you to make a right or left turn, remember that they are grading each one of those turns. Make everything count! We hope this article has been informative. Our 30-hour teen drivers ed course is available throughout the state. If you are seeking Las Vegas driving lessons, please call us at 702-907-9992. We’ve touched on the dangers of distracted driving in prior blog posts and by now, most people are aware of the dangers. Despite that recognition, many fatal and serious injury crashes are a result of distracted driving. This is especially true of new and inexperienced drivers. Younger drivers are especially susceptible to these dangers for two reasons; they do not have enough real time behind the wheel to fully appreciate how quickly things happen and they do not realize how distracting other things in their environment can be. For instance, most teen drivers, once licensed, relish being able to get in their car and pick up their friends. It is the sole reason, in many cases, why teenagers want their license; it represents freedom. It is precisely for this reason that many states limit a teen driver’s passengers to adults aged 21 or over, as well as limiting the times they can drive. These restrictions limit distractions to the teen driver. Another and probably more dangerous distraction is cell phones and other hand held devices. These devices are everywhere and almost every teen driver for the last decade has had one. They are a rite of passage and most teens have had them for an average of four or more years by the time they reach driving age. Using and responding to these devices is automatic and creates a massive distraction to the teen driver. It is behavior that is not easily unlearned. Cell phone use while driving is so dangerous that most states have made it illegal to even have one in your hand if you’re driving on a public road. Despite these known causes and solutions, we’ve seen no decline in accidents caused by distracted driving. It is for this reason that Toyota Motor Company has partnered with parents, educators and teen drivers in an effort to push these numbers down. The main focus is education, both for the driver and parent, as well as a commitment from both to be more safety-focused by working together. The site can be found at http://www.teendrive365inschool.com/ and focuses on what parents can do to better teach their teens, how teens can be better students to their drive teachers and how educators can create more dynamic and relevant lesson plans for teaching new drivers. Toyota is even offering a $15,000 award for the creation and submission of a self-produced PSA that covers the topic of distracted driving. There is a lot of good content on the site and all of you creative personalities have a chance to win a nice prize, all while creating something worthwhile. Nv Drivers Ed does not endorse Toyota products, nor do we receive any compensation from Toyota. We just think this is good enough stuff to pass along to you.